With an aggressive price-point of Rs 9,999 for 8 Gb version, Zenfone 5 comes with a mesmerising design that clearly impresses at the very first glance. Asus has integrated sharp edges and its signature circular rings on the chrome finish metallic bar at the front that certainly adds a premium feel. The power and volume buttons are placed on right and offers good tactile feedback. The matte finish removable back panel makes phone feel good to hold. Even so Zenfone5 has a removable back panel, its battery is packed under a thin layer of plastic which houses Dual-Sim slots. The phone boasts a 5 inch HD display that is sharp, produces vibrant colours and is good for watching HD videos. It is sensitive and even supports ‘Glove Mode’ that makes it handy in winters. Asus has integrated a new user interface- ZenUI over Android 4.3 Jellybean which is an important aspect of Zenfone series. ZenUI follows flat icons approach and comes loaded with Asus tweaks like Do it later to manage tasks, Asus links for connectivity, reading mode, Power saving mode, Miracast and also an Easy mode that has big icons for senior citizens. The new lock screen displays the upcoming events and other stuff nicely. Swipe down from left to check your recent notifications and from right for quick settings. The UI is refreshing and the best I have seen in a long time on any Android device. 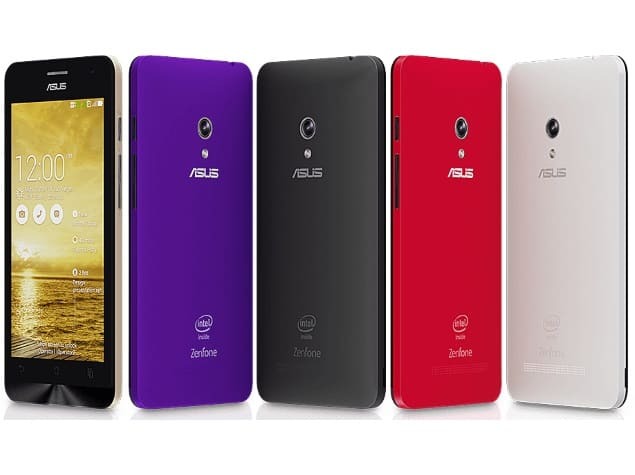 Sadly it runs on Android 4.3 Jellybean but Asus has promised that an update of Android 4.4 Kitkat is in the line. Asus has worked hard for the camera technology of Zenfone series. The camera on the Zenfone series is equipped with Pixelmaster technology that improves light sensitivity by combining pixels together which results in better imaging performance even in low light conditions. There is HDR, miniature effect, GIF, time-rewind, low light, smart remove, one touch lightening and all other possible tweaks for camera enthusiasts. You will not feel any desire to install any third party app for camera effects, it’s all there. I tested the camera to its limits and in a week’s usage it hanged once while extensive usage that includes playing with all available options and I had to switch it off to use it again, but that might be unit specific. Its dual-core Intel Atom processor with 2 GB RAM worked smoothly with day to day stuff, while multitasking and even playing the high end graphic intense games like Asphalt 8 and Fifa 2014 was a treat. Phone performed well and never felt sluggish, which is more than one can ask from a phone at this price. The phone has an inbuilt storage of 8 GB that is expandable up to 64 GB with micro SD card. In terms of the phone’s life, its 2110 mAh battery gave us four hours backup during our video playback test on Wi-Fi at full brightness. This usually translates into minimum of 9 hours usage on a single charge.